New year, new collections. 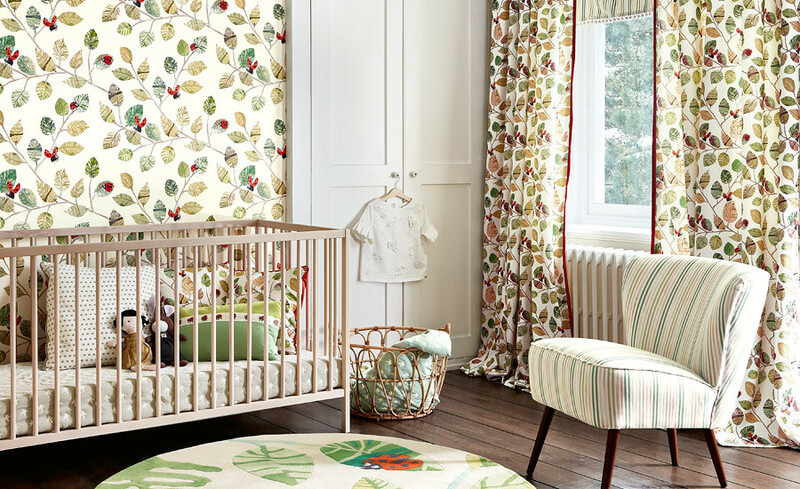 Osborne & Little have recently released a range of collections ready for Spring 2019, and here at Calico, we love them. Seven collections have been released, featuring many prints and patterns that are just stunning. The first collection on this list is Folium, a wallpaper range offering decorative floral designs that are oversized, a trending theme for this season. A particular favourite is ‘Green Wall,’ a design that replicates a cluster of green foliage, contrasted by either red and purple leaves or paler greenery, depending on your chosen colourway. This contemporary wallpaper creates a dark atmosphere that would look sophisticated in any room. 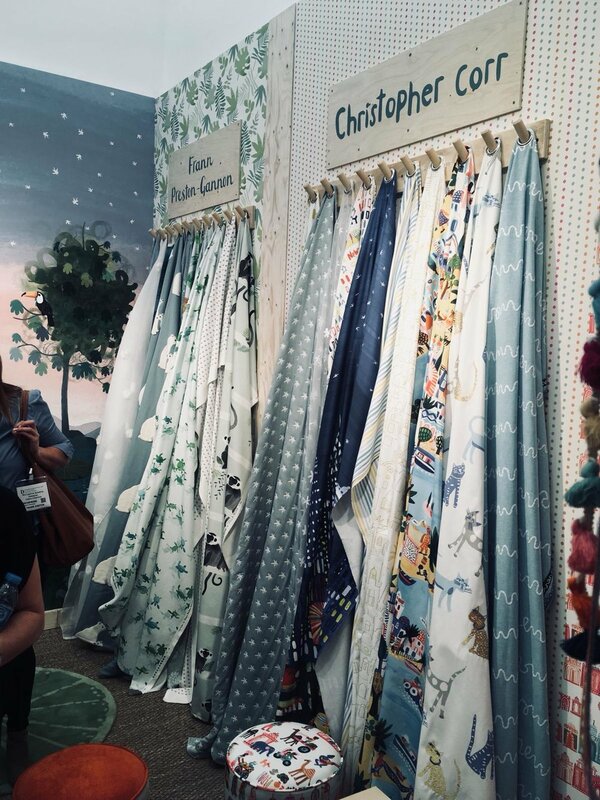 Another highlight from this collection is ‘Animal Glade,’ a beautiful design of exotic animals set against a background of trees and pastel skies. This design creates one whole image that would be perfect for a feature wallpaper. O&L’s next collection is Intermezzo Silks, a range designed specifically for curtains. Available in five designs, each with their variety of colourways, these fabrics are named after musical terms and are made up of silk combined with other materials. Overall, the colour palette for this range is neutral, especially when compared to the first collection. ‘Sinfonia’ stands out for us; it’s such a simple and lovely fabric, featuring contrasting dots that are reminiscent of an abstract painting. Memphis contradicts both of these collections completely. Designed by Margo Selby, these designs were inspired by 1960’s Motown and Memphis and feature a distinctive colour palette that’s full of fuschias, cherry tones, and citrus shades. The fabrics are comprised of a variety of wools and velvets. ‘Motown’ is a geometric print that includes contrasting circles, squares, and triangles, and truly captures the essence of the '60s. We’re halfway through the collections now, and the first of the final three is Albermarle, inspired by the streets and attractions of Mayfair. This range is made up of tailored woven fabrics with colours of aqua, coral, turquoise and navy, plus a few check designs. It’s ideal for upholstery, cushions and even textured headboards. The next range from O&L is Taza, a Moroccan-inspired collection as well as plain fabric to accompany the vibrant prints. Taza is a city in the north of Morocco, located in a mountain pass, and this location is reflected in these designs. A favourite of ours is ‘Temara,’ an exuberant set of roundels based on a background of linen. The last collection (but certainly not least) is Ariadne Velvets, a fantastic range in which opera characters lend their names to the fabrics. This range is opulent and uses silver as the key colourway, plus shades of royal blue and emerald, reflecting the richness of the velvets. ‘Poppea’ is one of our favourites, as it is based on typical ceramic patterns and named after the lead role of L’incoronazione di Poppea by Monteverdi, an Italian opera first performed in 1642. Here at Calico, we love these collections. They are all different and stunning in their own right and offer you the ultimate versatility for your home. 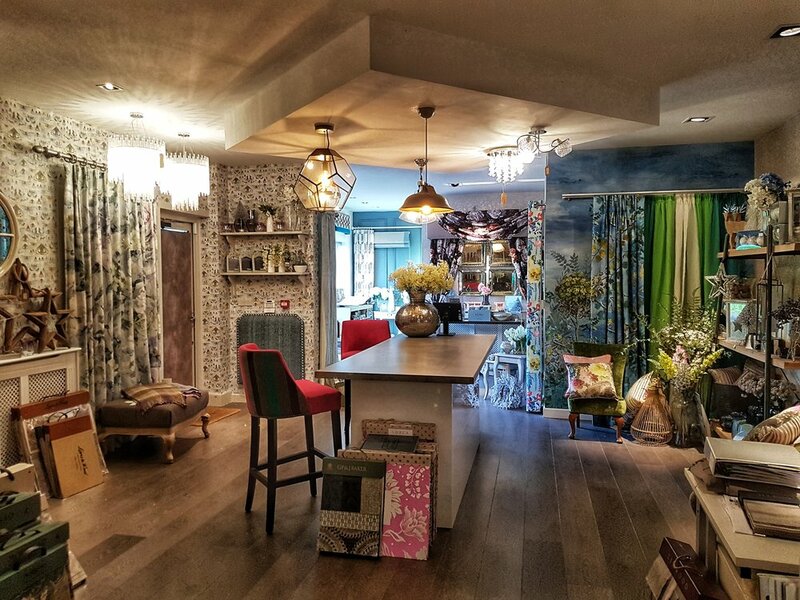 There are many reasons why we love working here at Calico, but being able to work in our beautiful showroom is definitely one of the top five. With our Christmas stock now rolling in, and with the fact that we’re relocating next year, we thought we’d show off our showroom to those who are yet to see it. If you see anything you like, feel free to pop in. As you walk through the front doors (be sure to check out our window display before you do! ), you will walk into our corridor that contains a small sofa, dressing table and mirror, all of which is available to purchase. You will notice that, behind the ‘showroom’ sign at the end of the corridor, are two doors. These lead to our workroom, where our fitters and seamstresses produce our beautiful products. 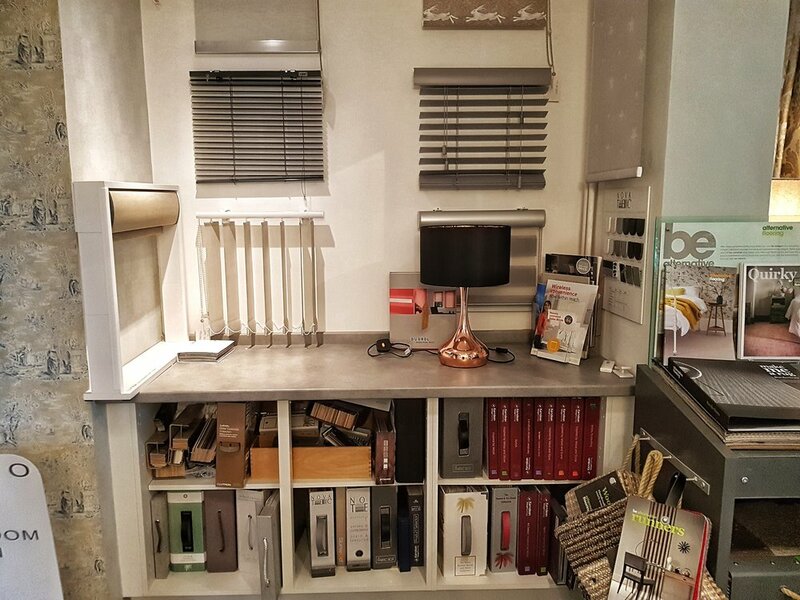 As you continue around the corner into our showroom itself, you’ll see on your left the selection of blinds that we make. Roman blinds are our speciality, but, as you can see here, we also sell vertical blinds, roller blinds and electric blinds, to name a few. Next to this, there is a stand for Alternative Flooring, one of our suppliers. They have helped us with many of our projects, including The King’s Mound. Opposite this is our bed display, which was installed in the summer. The lighter tones of the bedding are transferable, so they can work for autumn and winter as well. The bed itself is from Mattisons, and most of the fabrics came from Osborne & Little, who we have worked with very closely over the years. Some of the biggest projects in which their fabrics were selected were this retail customer, Glanmarlais Care Home, and another of our clients. You can also explore some of their latest collections here. The stripey bed throw is from Gallery and is also available to purchase. As we move along, you will come across our Romo rugs display. This is the first rug collection that Romo themselves have released, and we love them. Villa Nova also have a latest rug collection, which are also on display. Just behind this, you can see a suitcase-shaped desk, topped with photo frames, plant pots, and other miscellaneous items that you can buy, including one of our mini Christmas trees. The final display before you walk into the main part of our showroom features the Esta Button Back Chair, that is currently reduced in price, along with the accompanying foot stool. 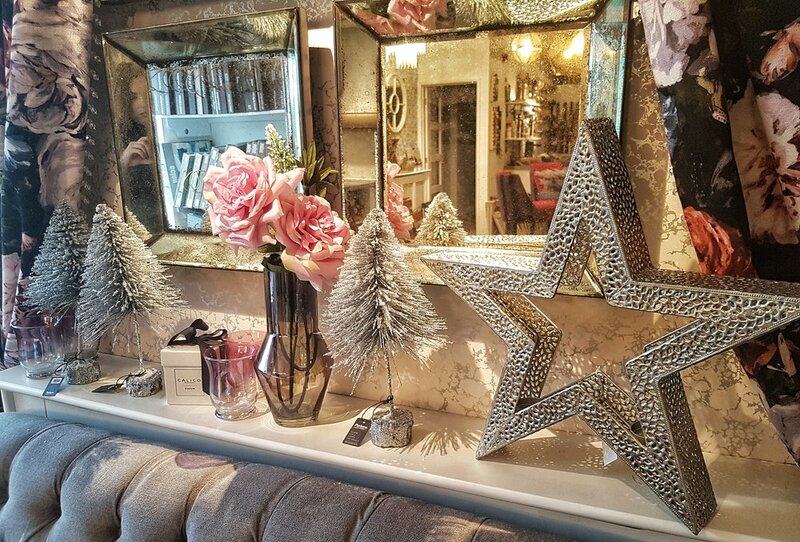 The dressing table has recently been decorated for Christmas, with our gold glittering star and snowy wreath peaking out from the back. There are also tealight holders, regal-looking hand mirrors and a design board displaying Colefax and Fowler fabrics. We have a circular drinks trolley, topped with bowls full of gold beaded hearts from Parlane, prefect to hang on your tree. Then, right on the corner, there is a set of three tables, adorned with fake flowers, tealight holders, a light up Christmas tree and candles. Now you are in the main part of the showroom. In the centre is the island where our designers will lay out pattern books for you to peruse, surrounded by high-legged seats for you to settle down in with a cup of tea. 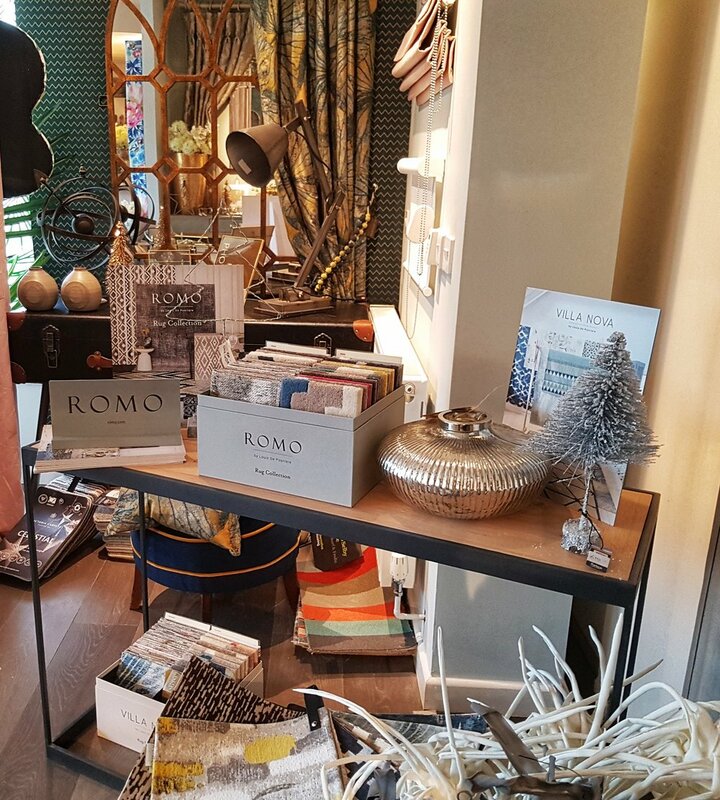 On the left, with our Designers Guild wallpaper display, you’ll see a pyramid of shelves that are currently holding more of our Christmas stock. We have silver versions of the gold star you saw earlier, plus baubles and reindeer. Next to these are the desks of two of our designers, who are there to lend a hand in helping you find what you’re looking for. Behind is the door that leads to our office where our designers and HR team are located. Above further shelves of pattern books, we have a display of some of the poles we supply for your curtains. Next to that on the left are some of the tiebacks we have for sale, coming from many brands such as Harlequin. Carrying on around, we have shelves on our Designers Guild butterfly wallpaper. This carries on past the matching curtain (behind which is our remnants cupboard). On these shelves fit photo frames and plant pots, all for sale. We are now nearing the front of the shop once again. 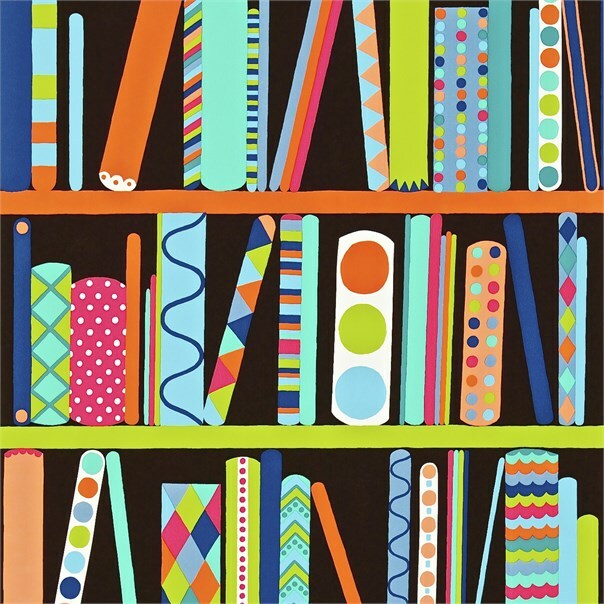 There are more pattern books to your right, all Harlequin and Scion. Dotted around the window are curtain poles, and nestled in the corner is a white dressing table topped with Christmas decorations. You can also see the back of our window display from here. In front of this, on the other side of the wall is our Clarke & Clarke interlined curtains with a swag heading, and below is a shelf that is slowly being taken over by more of our Christmas stock. The large silver star is a particular favourite of ours. We are now back at the entrance of our showroom. If you enjoyed this post and want to find out more, then come in and see in person. We’re more than happy to help. 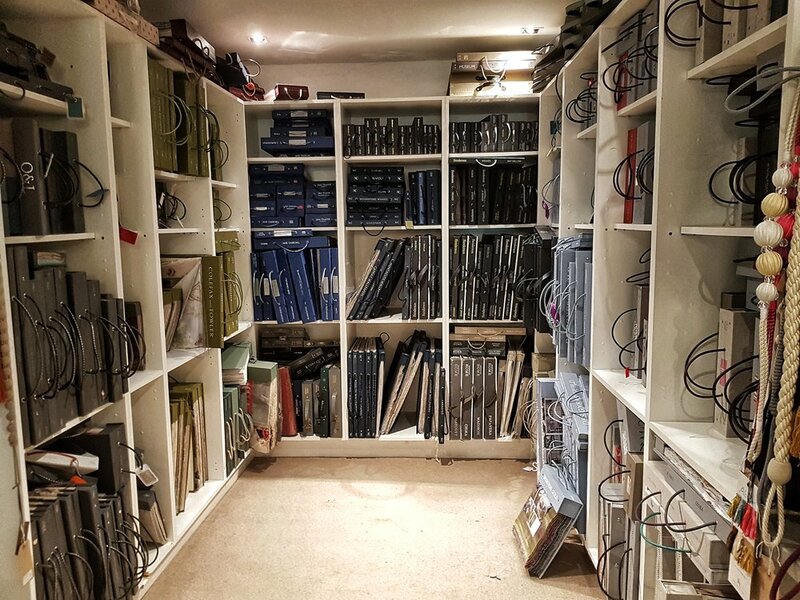 Our showroom won’t stay like this forever; we are already planning our Christmas window display, and our pattern book collection is only going to keep on growing. And with our relocating to the Lambsquay next year, there will be space for even more beautiful products to come! Until then, for more images of our showroom, check out the slideshow below. We briefly discussed Villa Nova’s latest collection over on our Decorex blog, but, seeing as we love it so much, we’ve decided to dedicate an entire post to it. It’s even the inspiration behind our new window display! 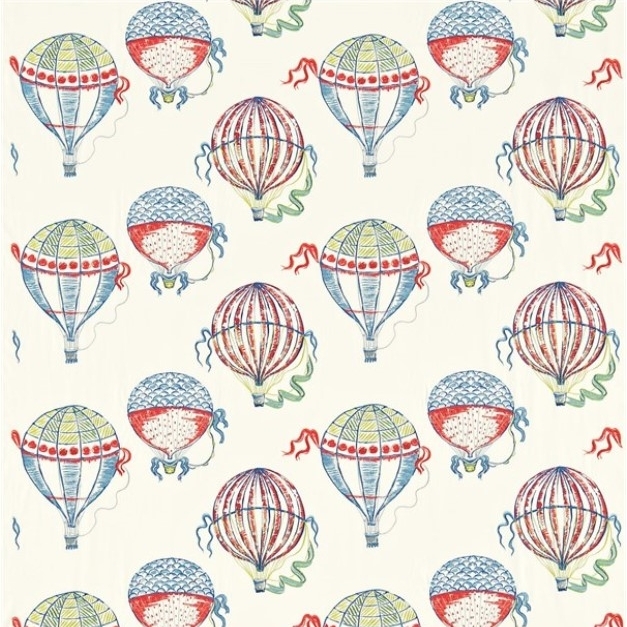 This collection is child-friendly, inspired by memories of the eccentric storybooks that we used to read as children. The website features colouring pages that you can print off, and the collection is told in ‘chapters’. Villa Nova has made this collection more interactive and fun, ensuring that your little ones are going to enjoy it even more. The first chapter of this range is by Frann Preston-Gannon, a London-based illustrator and author. Her designs are inspired by the exotic Amazon rain forest, and feature many animal-based prints. One of her patterns, ‘Monkey Bars’, feature many fuzzy monkey faces, creating a fun and exciting design. 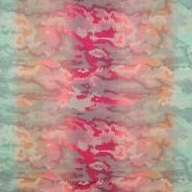 This has been printed as cushions, wall coverings, and fabrics. It is sure to add a mischievous touch to any room. 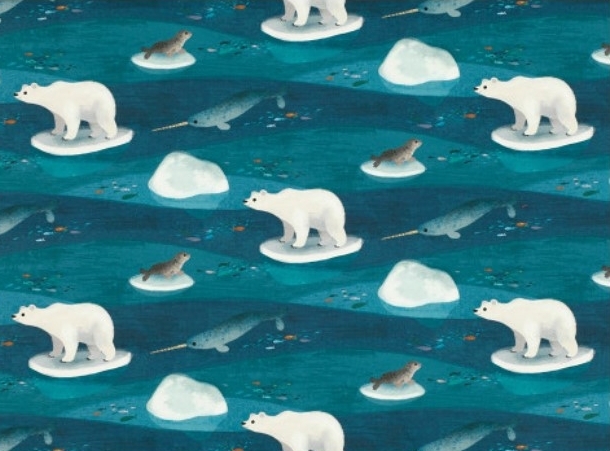 In complete contrast to the rain forest, Preston-Gannon also takes us to the Arctic, where polar bears and seals float across the sea on icebergs while fish and play beneath them in the water. A personal favourite of this collection is the ‘Bear Hug’ cushion. This adorable mum-and-baby design features a mother polar bear hugging her child on a blue fabric with a coordinating soft chenille on the reverse side. In the second chapter of our adventure, Christopher Coerr takes us to the pink city of India, downtown New York and the vibrant Mediterranean. With the ‘Hustle Bustle’ range, we explore the busy Indian street markets, where you can be amazed by the colourful animals and people whizzing by on their bikes. 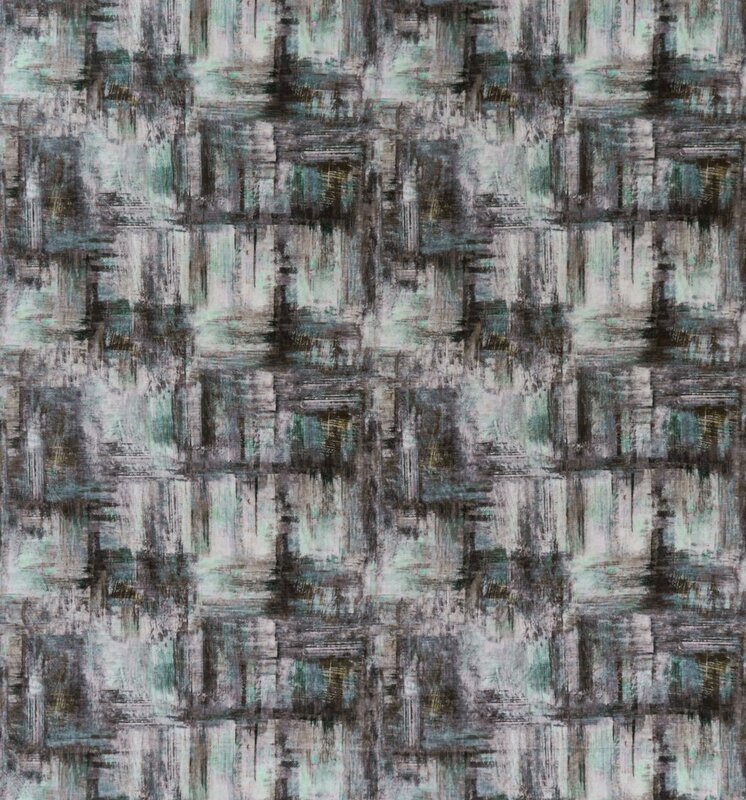 The ‘Hustle Bustle’ fabric, available in two colourways, is an exciting design that captures the busy atmosphere of India, featuring the range of people and animals that you would see on the Indian streets. His NY designs capture the bright city lights that dazzle anyone who sees them. ‘City Lights’ is a print that portrays the illuminated skyscrapers when their residents have turned on their lights. The design is simple: yellow rectangles and boxes embroidered onto a white background - not a building in sight. 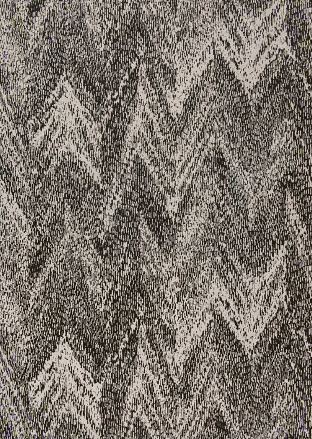 This geometric fabric is unique and can be paired with many other patterns in the collection, deeming it to be a very versatile design. Coerr’s final collection portrays the white-washed house and the vibrant blue sea. A nautical colour scheme is the basis for the products in this range, but they are still unique and full of life. The ‘Island Hopping’ fabric shows a hive of activity, full of boats sailing the sea, laughing children and pleasant villagers getting on with their day. Or, for a more toned down look, ‘Teeny Santorini’ is a wallcovering available in three colourways and focuses on the villas that line the hills of the Mediterranean. It is a simple print that features the outline of these buildings on a white background, making it the perfect contrast to Coerr’s more vibrant fabrics. The third illustrator involved in this collection is Yuval Zommer, whose designs gives us a bugs-eye view of the world. Tiny ladybirds, beautiful butterflies and buzzing bees are feature in this playful range, plus larger, much-loved animals, including little dogs! ‘Walkies’ present a range of dogs making friends with each other on their walk, with each one having its own character and design. Chickens peck away at an orchard in ‘Apples and Pears’, while frogs leap from pond to pond in ‘Duck Pond’. There is such a variety of prints in this collection, and the range of animals helps to ensure that children will surely find one they love. All three illustrators have also drawn wall stickers based on their designs, to decorate your home even further. 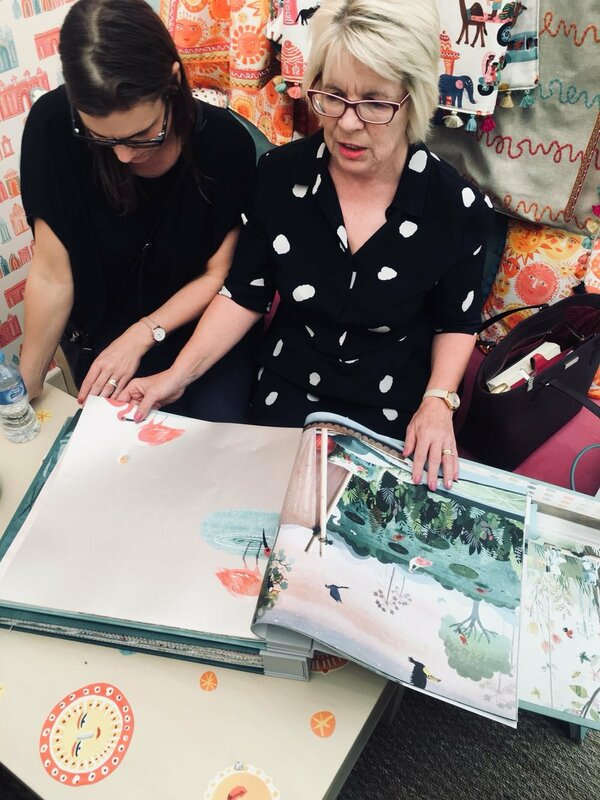 We used a few from Frann Preston-Gannon’s jungle range on our shop window, and we can confirm that they really helped bring our display to life. Villa Nova’s collection is different to most that we have in our showroom, as it’s rare to find an exclusive children’s range. We recommend coming to take a look, as you will be amazed by these exuberant prints that will add a fun element to your home. This year we took on the refurbishment of the King’s Mound, Oxford. Calico was very hands-on with this project, supplying the furniture for every room, as well as creating the soft furnishings. We also produced the oversized headboards in the four bedrooms, plus window seats for the dining room, entrance hall, and study. The overall design was opulent with a range of colours and patterned fabrics. 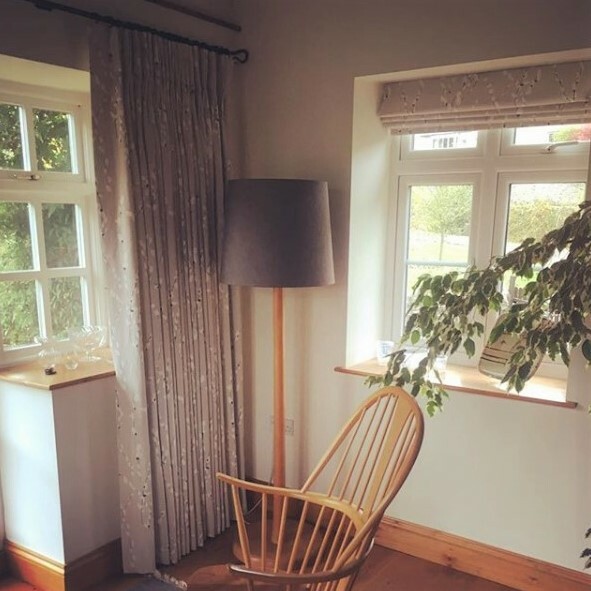 In the dining room, we used GP&J Baker fabrics for the chairs and window seats, and we butted together two tables from IJL Brown to make one long table. We supplied the rug from Alternative Flooring, lighting from Dar and artwork from Camelot Pictures. As for the sitting room, we fashioned some cushions using fabrics from GP&J Baker’s Historic Royal Palaces collection. 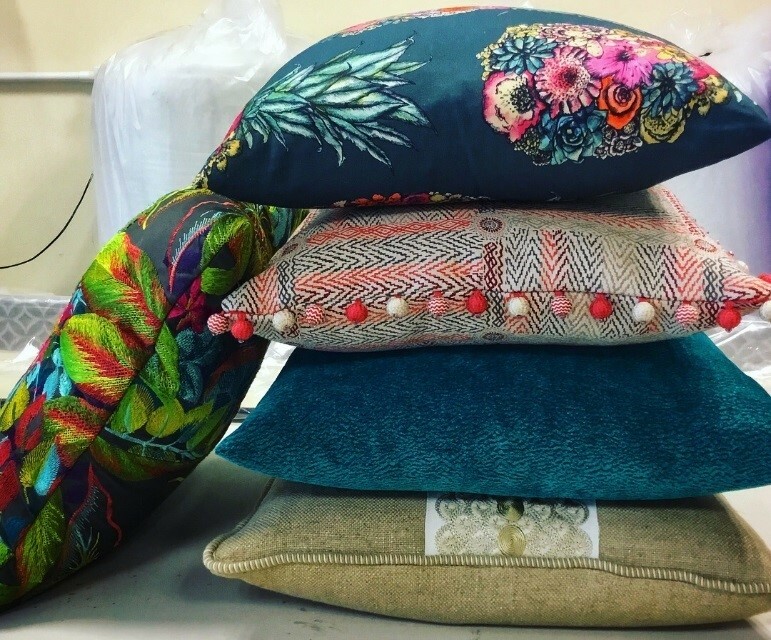 We used these designs many times throughout this project, as the collection is full of rich and diverse patterns and styles, that include supple velvets and decorative prints channelled from historic sites throughout the country. It is safe to say that this was the perfect collection for this project. For the master bedroom, we supplied furniture from Neptune, including the chest of drawers and coffee table. Like the rest of the building, we supplied lighting from Dar. The bed throw was made with Clarke & Clarke ‘Odyssey’. 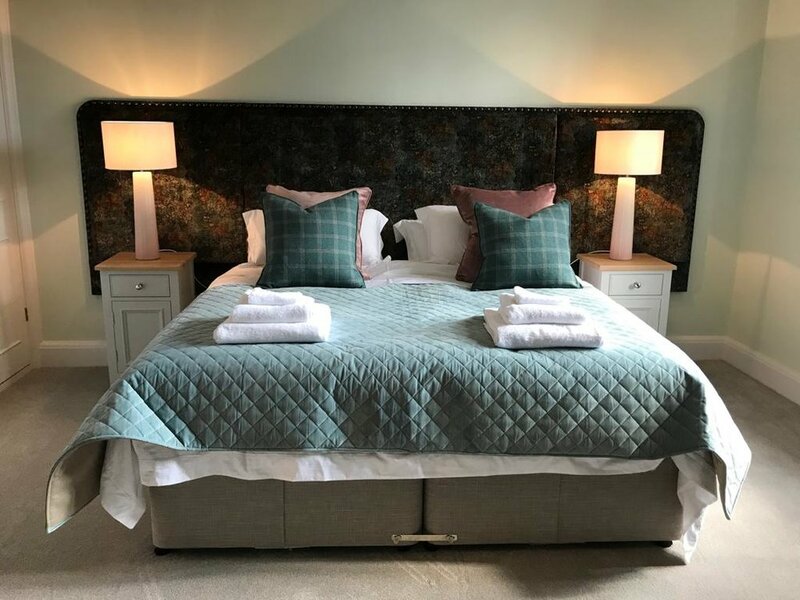 This textured fabric was paired with cushions that were created using ‘Royal Garden Linen Quartz’ and ‘Nevis/Lovat/Heather’, fabrics, both by GP&J Baker. These patterns stood out against the plain bed throw, resulting in more decorative and luxe-looking bedding. We also supplied the chairs and all sofas from Tamarisk, which we finished with a range of fabrics and designs. In the sitting room, the two large sofas were upholstered with ‘Bute’ by Mulberry and ‘Wosley’ by GP&J Baker, while the chairs in the master bedroom were also finished with the ‘Bute’ fabric, but in a different colourway. The armchair in the third bedroom was upholstered using ‘Queens Garden Velvet Jade’ by GP&J Baker, again from their Historic Royal Palaces collection. We used Mulberry’s ‘Bute’ fabric again for the chairs in the third bedroom, but in a different colourway. We also supplied the furniture for the dressing room, including the sofa bed from Seb, which was then upholstered with fabric from Mulberry. In all four of the bedrooms, we created oversized headboards by butting three together. 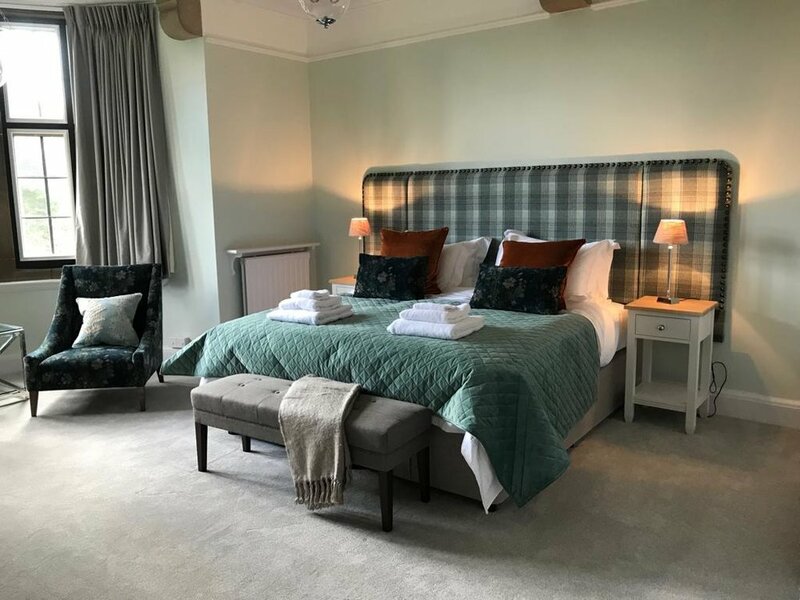 We used a range of fabrics that matched the cushions and bedding, adding studs around the edges using Heico Antique Brass low domed upholstery nails. 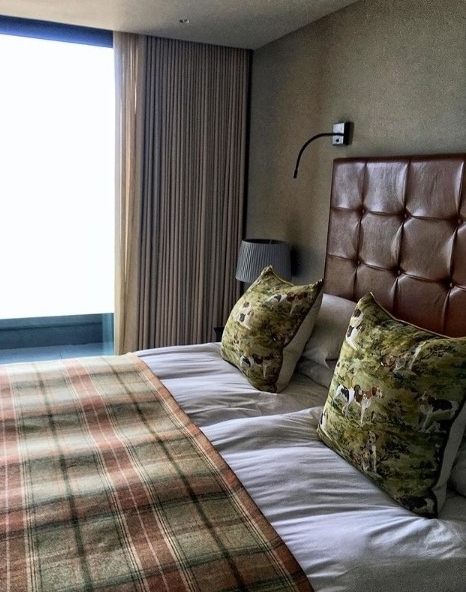 We ensured that each headboard fitted each rooms’ individual colour scheme. We also supplied furniture for the conservatory, dressing room and entrance hall. For the latter, artwork from Camelot was hung on the walls, and we produced window seat pads. These were also created for the study. We have enjoyed seeing the rich and opulent design of the Kings Mound come to life. We were very hands on with this project, even supplying napkins from John Lewis. The overall look features many autumnal themes, including textured fabrics and darker hues. Creating this luxurious scheme has been a highlight of our year, and we’re extremely proud of how it looks. Romo Fabrics have introduced their first rug collection, a collaboration with Louis de Poortere, renowned rug manufacturer. The rugs are inspired by the most popular designs from their past collections, and with a choice of colours for each, widening the selection further. These contemporary designs feature many intricate patterns. The flat weave range features textural details that are woven using tactile chenille, enriched with sophisticated colours. The hand tufted rugs are created with wool yarns and have a deep pile to add depth and a richness in colour, making them a sumptuous addition to your home. This stunning collection includes many on-trend designs, such as 'Cubis', which features interlocking squares, 'Scala', an intricately-woven chevron design and 'Nahli', which is reminiscent of traditional tribal patterns. To contrast these bright prints, Romo has also created a subtler style of rug, 'Itsuki', that is still as equally as decorative as the rest. Each design is unique; they come in multiple sizes and colours, providing a wide range that anyone can enjoy. From a dramatic floral print or a painterly brushstroke pattern to a Moroccan style design and colourful broken stripes, each rug will be a lovely accent to any room. We’re very excited to have received the samples of this collection, and we can confirm that not only do they look stunning, they’re extremely soft to touch. Romo's rug collection is exquisite and ideal for anyone wanting a contemporary home. Image by Calico Interiors via Instagram. As our long summer comes to an end, we take a look at the latest collections from Osborne & Little. Each collection features a variety of vibrant prints and fabrics, perfect for brightening up your home this autumn. 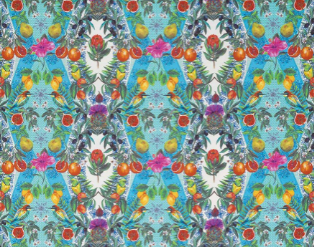 One of the recently added collections is Deya by Matthew Williamson. Williamson is known for his love of colourful patterns and global influences, and this new collection is no different. Inspired by the atmosphere of the Balearic Island of Mallorca, these fabrics feature many embroidered exotic designs that reflect Mediterranean colours and themes. This influence is evident in some of the fabric names: ‘Valldemosa’, named after one of the small villages in Mallorca, ‘Formentera’, a small Balearic island, and ‘Talavera’, which is named after Talavera de la Reina, Spain. This city is known for its ceramics, which Williamson has presented clearly in this fabric through the uses of vivid colour and decorative prints. The cultural influence that Williamson had in Mallorca is reflected in the rich detail of this collection, which we are certain will brighten up any home. To accompany this colourful collection, Williamson has also launched Calobra, which is a pair of versatile fabrics that will coordinate beautifully with Deya. These chenille fabrics come in a wide range of colours and are the perfect companion for the patterned designs. 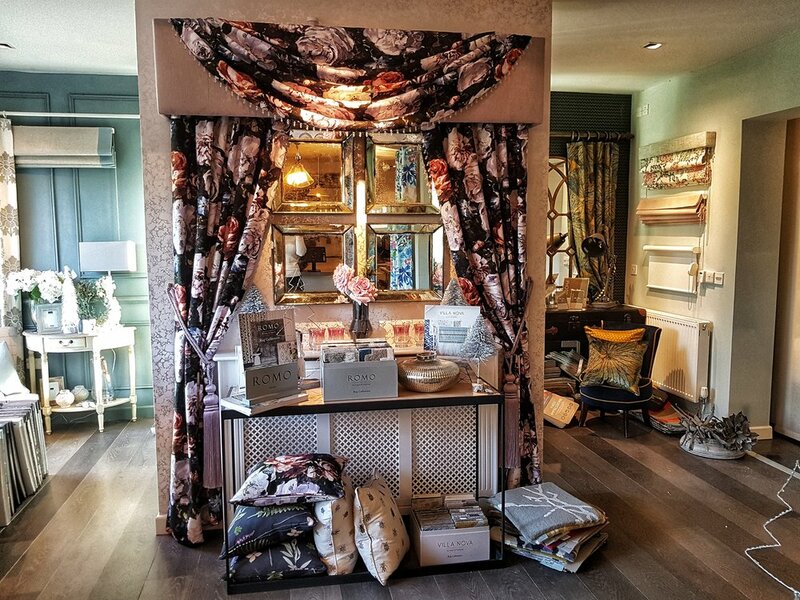 Nina Campbell’s latest collection, Les Indiennes, was inspired by 17th and 18th century French vogue textile designs that originated in India. She breaks away from her iconic blue, coral and aqua palette that usually features in her collections and has instead created unique colour combinations that feature pairings of black with emerald and red with teal. The Indian influence is clear to see in the floral patterns, such as the Indian flowers that also feature on her textured wallpapers, such as 'Baville', a wallpaper from the collection. Campbell's collection has more than patterned designs. She has also introduced the Poquelin collection, the ideal complement for Les Indiennes. The collection is named after Jean-Baptiste Poquelin, the real name of 17th century dramatist Moličre. The fabrics are semi-plain and elegant, with a wide range of colours for each one. 'Colette', named after 20th century novelist Gabrielle Colette, is a smart linen that is available in thirteen colours, meaning that there is one for every interior. Here at Calico, we love these new collections. This range of beautiful patterns and styles offer you the ultimate versatility to decorate your home with this autumn. 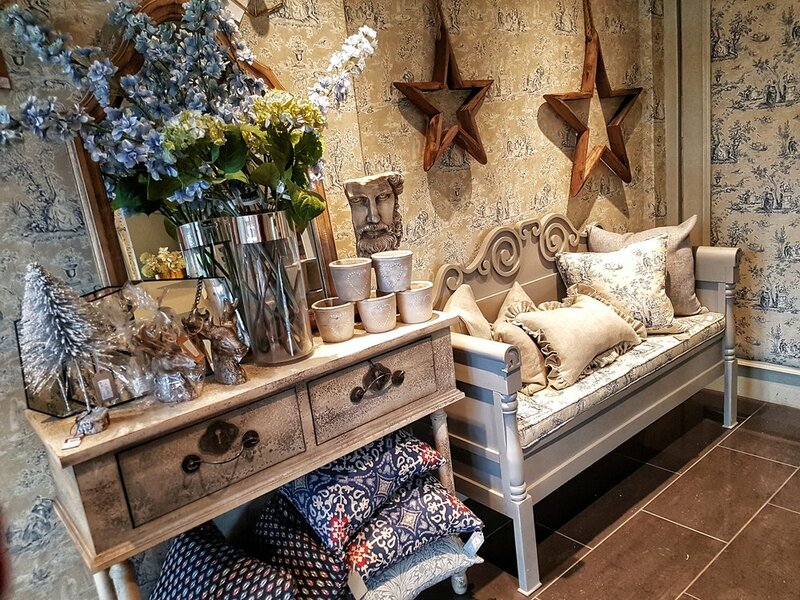 This wide range of designs will make a lovely feature in any room.